Opte Reviews: Real Help for Spots on Your Face or Hype? Opte is a skin lightening system for all skin tones that relies on a digital-age skin perfecting system to give you a smoother appearance without age spots. Opte Review: Real Help for Spots on Your Face or Hype? 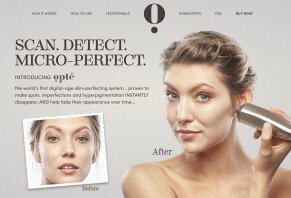 For those looking to minimize the look of dark marks on their face, Opté claims to be the world’s first “digital-age skin-perfecting system,” and it promises to make your age spots, sun spots, hyperpigmentation, and natural freckles disappear instantly with a serum, while also working to fade them over time. According to a company press release, the Opté brand is one of the first to be developed by P&G Ventures, a partnership program for funding and supporting startups, entrepreneurs and innovators. The product website states that the Opté system is fast, gentle and easy to use, and it offers three color tones (fair, medium, and deep) for matching all skin types. With these claims, the Opté system promises to provide a solution for the millions of people who don’t have the skin complexion they want. But can it deliver? Let’s look closer at Opté so you can come to a conclusion. Opté’s skin care is based on a battery-powered wand that relies on a blue LED light to detect age spots. The secret to the Opté wand, the company states, is that it can analyze your skin to detect age spots and then administer a serum to just the places you need it so that your skin retains a natural appearance. To put the Opté skin device to work, the company suggests first applying all sunscreen and liquid skincare products you need for the day. Using them after the treatment will smear the serum, though it’s okay (even recommended) to apply finishing powders, bronzers, and makeup after to complete your look. When you’re ready to start, you need to attach the replaceable tip to the Opté wand, placing it lightly against your skin. Then, applying gentle pressure, you can slowly roll the device up and down your skin in long, deliberate strokes. The device administers a Tone Perfecting Serum to your face, which purportedly includes skin whitening agents to reduce the appearance of age spots and freckles, as well as moisturizers and mineral pigments to keep your skin hydrated and perfectly blended. After one section is done you can move to the next, keeping in mind that multiple passes over the same skin adds additional coverage. The company suggests using the Opté for between two and five minutes each session, though your first attempts might take longer as you get comfortable with it. Once finished, you can apply makeup as usual, taking care not to smudge your skin with moisturizers or liquid products. Likewise, washing your face will remove the serum and reveal your age spots until you reapply. Unlike laser treatments, the Opté is purportedly gentle on skin and doesn’t require any downtime. This means that the device is safe to use on all parts of your skin, including the face, arms, and hands. Though the Opté system promises to improve your appearance in the short term, the device’s real selling point is the effect on your skin over time. The company promises that your skin will feel smoother after two weeks and that it will appear healthier after four to six. After eight to twelve weeks of treatment, they state your skin spots will appear faded, even without the serum. At the time of writing, Opté was sold through an installment program for $124/month for four months or a one-time cost of $499. Within this starter kit is the beauty wand, two wand tips, a device cradle, and power cord, as well as a four-month supply of the necessary Tone Perfecting Serum. It’s possible to buy 60-day refill kits for the device for $129 each. These come with a preserving disk and enough Tone Perfecting Serum to last through two months of daily treatment, which means that the cost of buying the Opté wand and enough refill serum to last for a year will cost you $1,015. Each starter-kit purchase qualifies for a two-year warranty that covers all necessary servicing and replacement. You can contact the company directly with any servicing requests at (844) 627-7738. The company stands by each purchase with a 30-day satisfaction guarantee. This means that if you aren’t happy with your purchase after a month of use, you can contact the company for a UPS return shipping label to send it back for a full refund. What Do Customers Think of Opte? Does the Opte wand work as promised? Though we found reviews for the device online, an article published by The Verge highlights the experience of attendees at CES (Consumer Electronics Show) 2019 with it. Comparing the wand to a thermal ink jet printer for your face, both BBC and Venture Beat reporters documented the experience of trying it out on their skin on videos. As they guided the wand around their face, the reporters compared it to ‘photoshopping in real life’ and commented on how little serum actually made it on their face, thanks to the wand’s precision accuracy. Though these reporters were impressed with the results immediately after using Opte, they noted that the results didn’t last long and that their facial imperfections reappeared once they washed their face. Which Products Are Similar to Opte? There are numerous products on the market that promise to lighten skin spots, including the Admire My Skin Ultra-Potent Lightening Serum and Kireina Skin Lightening Lotion. Both of these products cost between $20 - $25, and they each purportedly will lighten discoloration and dark spots on your skin. You’ll pay $23 for one ounce of Admire My Skin on Amazon, while the Kireina Lotion costs $20 for almost ten ounces. Both products have positive reviews on the site, many of which are accompanied by before and after photos that highlight noticeable results. The serum contains hydroquinone as its active ingredient, a compound that WebMD tells us works to block the process in the skin that causes discoloration, meaning that it works to both lighten dark spots and prevent them from appearing. The Kireina lotion contains other lightening ingredients like niacinamide, kojic acid, and alpha arbutin. Which of these products would we recommend? In truth, the high price tag and lack of reviews about the Opté system make us slow to suggest it. In contrast, there are dozens of positive reviews for the serum and lotion we looked at, and each product costs less than $25. However, if it’s important to you to just treat the parts of your face you want to lighten while leaving the rest of untouched, there’s reason to consider the Opté system. Our Opinion: Is Opte Worth It? As this review shows, the Opté system is a skin-lightening system that promises to improve your complexion by instantly removing the appearance of dark spots and causing them to fade over time. The device claims to use breakthrough LED technology to target darkened skin with pinpoint precision and to fade their appearance over time. However, we couldn’t find any reviews of how well the device works for real customers besides attendees at CES 2019, and it costs $499, plus $129 every two months after for replacement serum. This makes it far more expensive than the skin lightening competition like the Admire My Skin Ultra-Potent Lightening Serum and Kireina Skin Lightening Lotion. For these reasons, we think there are better options available for lightening your skin. If you’re concerned about your complexion, we recommend making an appointment with a dermatologist to get a professional opinion before dropping hundreds of dollars on a skin care system like the Opté. Write a Review for Opte!